Monday, September 12th, 2005 | 6:50 pm	and filed in ReBirth, Tutorials. To some surprise, ReBirth does run in OSX Classic mode with certain limitations. 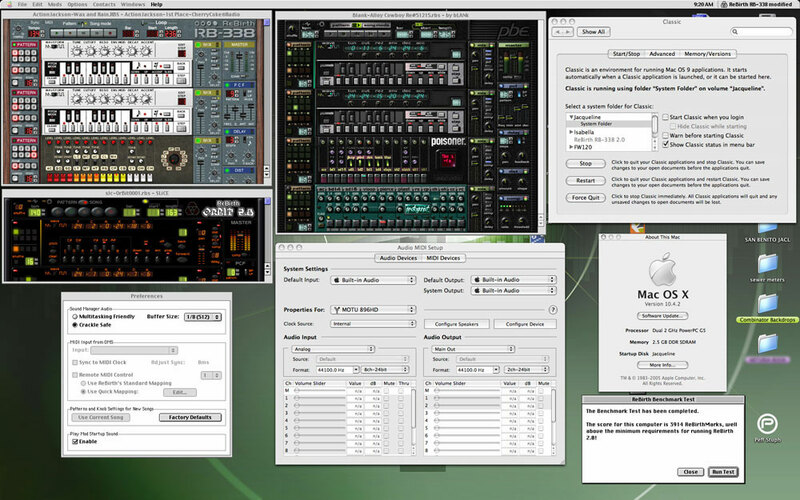 If you want to use ReBirth on a Mac, ultimately it’s best to use an older system that supports MacOS 9.2.2 with OMS for MIDI support and compatibility with certain audio interfaces. ReWire is not supported when running ReBirth in Classic Mode, and ReBirth will not interface with Reason 3.0 in OSX. Another limitation exists with MacOS X Classic mode and audio interfaces, and ReBirth in Classic mode will only function with built-in audio ports of Apple machines. Trust me, this is not impossible, but it might not be as convenient as it was in 1997. Before you start, you must have a MacOS 9.2.2 installed on your hard drive. For most new systems, you should have a CD-Rom called “Additional Software & Apple Hardware Test” which contains the installer for a Classic System. Once classic mode is installed you can launch MacOS 9 from the system preferences menu in the System/Classic item. You will need is the ReBirth RB-338 image file for MacOS. This is the file that ends with the “.img” or “.cdr” extension. These are available on the bittorrents issued from the ReBirth Museum. There are two downloads available for Mac users and both will work for installing and running ReBirth in OSX. If you plan to install ReBirth on a dedicated MacOS 9 machine, download the “.img” file. Once you have an image file on your system, simply double click it, and Disk Utility will mount the CD-Rom on your desktop. Within the the ReBirth RB-338 2.0 CD, you will find the installer. Double click on the install package, and install the application on your system. Launching the ReBirth installer will automatically start up Classic Mode. Proceed with the process and install ReBirth in your applications folder. Now simply launch ReBirth…unless you have an audio interface… then check the next paragraph. Audio Interfaces may not be fully compatible with Mac OS X Classic Mode, and if you launch ReBirth, you may encounter an error that states “ReBirth RB-338 can not access any sound card. It/they might be in use by other application(s).” You will be prompted to Quit. It seems that classic mode only finds built-in audio appealing, and you will not be able to run ReBirth through some audio interfaces. First Shut down Classic Mode, and then open the Audio MIDI Setup Utility (found in the applications\utilities directory). Set the default output to “ Built-in Audio”, and then Relaunch Classic Mode. Now ReBirth will find a suitable audio port and get past the pesky sound card check. Once ReBirth is running, access the Preferences found in the Edit Menu. Set the sound manager audio settings to “Crackle Safe”, and the buffer size to “1/8(512)”. Other settings may work, but you may encounter problems with the GUI animation and occasional audio glitches (I know some of you will think this is cool… try setting the buffer to 8(32768) for some nasty audio glitching). For those who never experienced MacOS 9, the operating system features settings which allow you to dedicate how much memory is used by each application. Classic Applications still feature this setting, and if you intend to install a lot of ReBirth Mods, you must change the memory allocation to accommodate the extra samples and graphics. Quit ReBirth and find the application in the ReBirth RB-338 2.0 directory. Click on ReBirth RB-338 (only one click) to select it and select “Get Info” from the File Menu. Expand the “Memory” pane by clicking on the fold down icon (triangle) and set the Preferred Size to a value of 65000 or greater. This will allocate 64megs of ram to ReBirth which should handle all of the mods available from this site as well as the ReBirth Museum. Close the info window, and relaunch ReBirth. Despite the limitations like a lack of audio hardware support and midi, it’s still nice to take a look back at the old mods. One option is to connect the built-in audio outputs to your audio interface. If you’re interface has lightpipe S/PDIF inputs, you can route built-in audio via a fiberoptic cable from your new generation G5 or Powerbook. Yes these are limitations, but it should be reassuring that it’s still possible to use ReBirth! I use the MOTU CueMix app. It runs independently of the audio drivers (at least it does on my machine). So the optical outputs are mixed through to my monitors. I think it should work with the 828 as well. OK so I finally get around to re-installing Re-Birth in OSX and it’s installed but it keeps asking me for the rebirth CD which is in the fricking drive (it’s a legit copy, I’m a registered user). Any ideas? I have to access an old song I did like 5 years ago and I don’t a have a good AIF of it only the original *.rbs file. If any one know how to by-pass this sticky issue please help! hmm… that’s a new one. Is the CD Mounted on the desktop? i got rb338 running under the classic desktop without an issue, but it refuses to see any of the rbm files. they’re all in the mods folder in my rebirth folder. no idea why it won’t register. That’s odd. Absolutely none come up? or do you just get the four initial ones added with the installer? Hi. I just installed Rebirth RB 338 but I cant get it to work. When I have the 1.5 disc in the drive a pop up comes up saying that I need to put the 2.0 upgrade into the drive. When I do that another pop up comes up saying that I need to put the 1.5 disc in. It just keeps on going on like that! I tried to restart the computer and the installation but it doesn’t work. What is going on?! Erik, this was an older known problem that occurred with the ReBirth 2.0 upgrade. I can only recommend that you uninstall all versions of ReBirth and start fresh from the 2.0.1 image. I’m even able to get midi sync to Ableton Live using MidiBridge9X. Nice one Peff! I’ve been using an old laptop just for ReBirth - LOL! Not anymore. very good info, but i have 1 last question, it stays impossible to rewire rebirth in reason 3.0 on OSX? if so… damn.. any other options then working on a pc? i dont have any built in audio, only usb speakers or an edirol ua-25. is there any wayy this will work? G303: No it’s not possible to rewire ReBirth with Reason. Simply because there is no ReBirth engine for OSX. Emp: Try setting the AudioMIDI prefs to run with your usb drivers. It might work. Let me know what you find out. My output is set to built in audio. Is this happening because i unzipped in Osx or does this not matter? i’ve searched the message boards and i haven’t seen this problem crop up with others. Classic application installers may try to install Mac OS 9 applications at the top level of your Mac OS X disk. To avoid problems with access privileges, either log in as an administrator before you install a Classic application or choose a folder where you have appropriate access privileges. I am running mac os x 10.5, which doesn’t support classic mode. is there any way i can run rebirth?